"Social Cartographies" is a biannual peer-reviewed journal of sociology, placed on the scene of contemporary social sciences as a common space open to different contributions to the discipline. The journal aims to be a space to spread knowledge for those who, in different ways, work in social institutions, academic communities, politics and associations, and who prefer the encounter and the comparison between experience and different research traditions. Therefore, the journal aims to place sociology in the middle of the social sciences debate. The journal wants to enter the main database (sociological abstracts, journalseek, google scholar...) in order to gain visibility "inside and outside" the world of academia. The journal is associated with a book series (having the same title, "Social Cartographies") published by Mimesis, which will include the same scientific committee, and where special attention will be given to monographs and editing works deepening the key issues of the work groups and of those who want to spread their research work. Therefore, "Social Cartographies" gives the voice to the numerous sociological geographies mapping the present time, using both the qualitative/ethnographic methods and the quantitative research. A "sociological imagination" space, representing a polysemous voice in the context of research and analysis of the contemporary societies. "Social Cartographies" intends to publish original theoretical and empirical articles about all the areas of sociology, in the form of essays, research materials and methods, as well as essay reviews and comments. 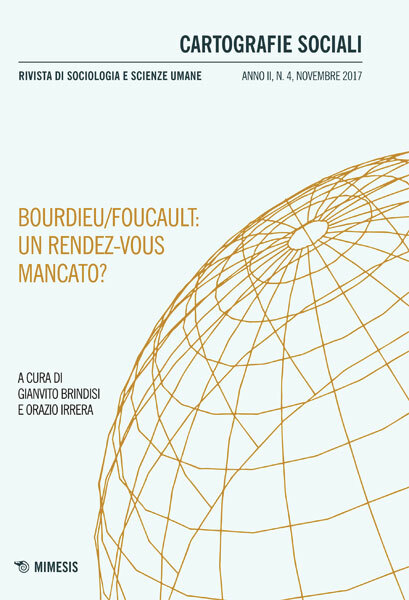 The journal publishes articles in Italian, English, French, Spanish, giving space to the contributions of the recognised sociology, as well as to the young researchers, fellows and graduate students' sociological contributions.